For hundreds of years, An Enchanted World Parallel to earth has existed, filled with hope and magic, ruled by a royal line of witches, who harnessed the magical power. Danforth, an evil man hungry for power sought to destroy them and steal their magic, but before he could succeed, the last royal Princess Sarah, escaped. When the two worlds aligned once again on the night of her daughter’s birth princess Ruby, Sarah was captured and taken back to the enchanted world. Sarah knew to prepare Ruby’s father, Ted warning him of the evil forces that might come from her parallel world seeking to steal both her power and their new princess Ruby Strangelove. Years later, Ruby discovers that she possesses the magic her mom left her. Now determined, Ruby plots a scheme to save her mother from the evil Danforth and bring her back home. Ruby united with her friends help, together they join forces. 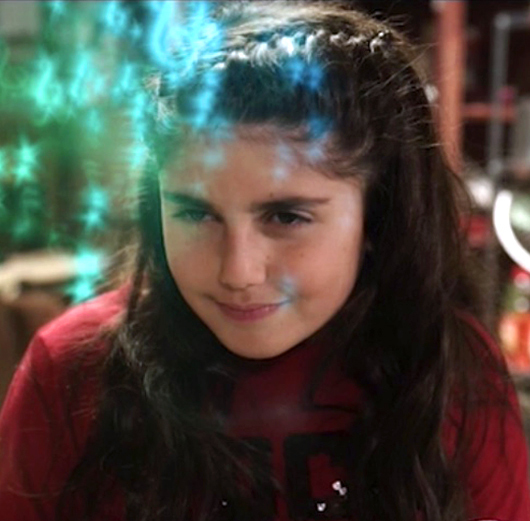 Ruby uses her magical power to help free her mom escape from Danforth’s Evil Scheme. Watch the Trailer from An Enchanted Ruby starring Seanna Pereira. Opening Night November 30th. Find out when and where you can join Seanna Pereira in her efforts to stand against Bullying. An Enchanted Ruby is a story that features, love, family, magic and music. Look for updates on the next screenings and events in your community. Buy An Enchanted Ruby Now! Click below to buy a download, rent a stream or purchase tickets to screenings. "The magic was in you all along. You just needed to believe to find it."